﻿﻿View of “Legal Tender,” 2014. For her solo debut, “Legal Tender,” painter Emily Erb directs attention toward some of the United States’ most difficult historical passages by presenting dollar bills as surrogate American flags. Erb began working with U.S. currency as a motif after noticing the Occupy movement’s activist use of blown-up bills on protest banners. Her first works were hung in public parks and markets around Philadelphia, where she is based. Unlike Dan Tague’s poster-like scans of folded U.S. currency that spell out political aphorisms or Chad Person’s intricate, cut-bill collages depicting contemporary military scenes, Erb’s dramatically enlarged historical currency urges a close, critical look at each bill’s original imagery and text. Curated by Maiza Hixson, this exhibition features twelve silk flags, each six feet long. 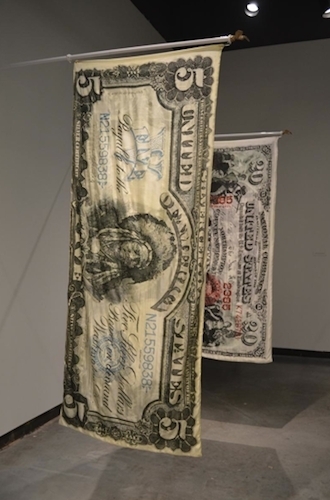 Dollar bills dating from 1862 to the present have been traced from photocopies and then painted onto the gauzy fabric at nearly eighteen times their standard size. The billowing silks are equally fragile and imperious: Hanging procession-like on golden American bald eagle–capped flagpoles that are uniformly spaced and perpendicular to their respective walls, the flags recall a military color guard and gesture at the inexorable qualities of history. Erb’s selections of imagery, pulled from a currency collectors guide, focus on gender and race inequalities. Baptism of Pocahontas, 2013, depicts an American Indian woman’s entirely mythical conversion to Christianity. America Presents Electricity to the World, 2013, features a winged woman surrounded by cherubs and draped in voluminous folds like a religious icon; she proudly holds a light bulb—a mere mannequin for the achievements of a male workforce. See also In Memoriam, 2013, which presents a confederate $500 bill with the titular poem lamenting the currency’s worthlessness inscribed in smudged black ink on its verso, frequently stamped on post–Civil War confederate money. These inflated dollars can’t help but refer to the current economic situation as much as to this nation’s past.